Hingis continued on her career success tour by winning both the US Open and Wimbledon women’s singles championships in that same year, she returned to defend her Australian women’s singles title in 1998 & 99. Her star shone brightly in doubles matches, where she notched up four Australian Open Championships and two Wimbledon and French Opens, which she followed up with another US Open victory. These achievement racked her up a total of 209 weeks that she spent in the top WTA rankings spot. A spate of injuries forced an early temporary retirement during 2003; however, she returned with a vengeance in 2006 where she won another mixed doubles crown at the Tennis Australian Open, and followed that up with an Italian Open victory. Her blazing 2006 return prompted a well-deserved Laureus World Sports award. In the latter part of 2007 Martina made the announcement that she was the subject of an investigation after returning positive tests for cocaine at that year’s Wimbledon. Despite maintaining her claim of innocence the Swiss star made the decision to retire for a second time rather than to continue fighting the charge allegations. At the start of 2008 in January she received a two-year suspension from the International Tennis Federation. 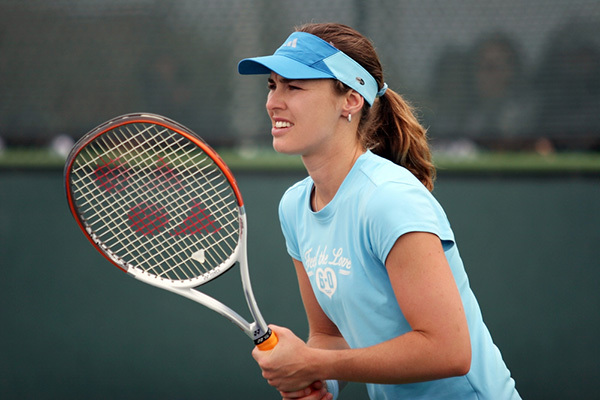 Hingis, not being a quitter, made her return to compete at professional tennis for a third time during 2013; however, with this return she remained a strictly doubles competitor. During the following year, she ran victorious at the 2014 Miami Open while partnered with Sabine Lisicki, and built on her victory by reaching the U.S. Open final while partnered to Flavia Pennetta. 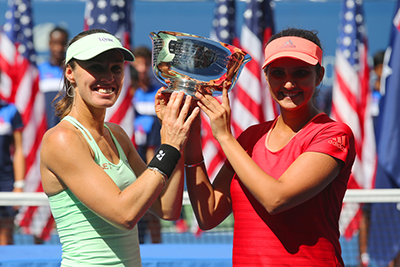 At the start of 2015, she had teamed up with men’s player Leander Paes and claimed the Australian mixed doubles crown. Despite Martina Hingis having an adopted Swiss citizenship, Melanie Molitor – her mother was formerly known as a tennis pro in the now-defunct Czechoslovakia, and she named Martina her daughter, that would one day become the youngest women’s number one ranked tennis player in the world, after one of Czechoslovakia’s most accomplished tennis stars, Martina Navratilova. When Martina reached age 7, her mother Melanie moved the family to Switzerland after marrying a Swiss computer scientist. Women’s tennis great, Arantxa Sanchez Vicario, once said after suffering defeat at the hands of Martina that she placed the ball truly well and she had the equal ability of remaining at the back of the court, but was equally adept at going into the net, and in doing so she comes into the ball exceptionally well. One of Martina’s strengths is to place the ball with astounding precision, especially from such a young age, which makes her placement of the ball somewhat reminiscent of Atlanta Braves’ Greg Maddux, one of the premier control pitchers in baseball who is well known for methodically working the ball around the strike zone edges. Hingis who stands at 115lbs and 5’ 6”, could be called petite lacks the ability to overpower a ball like numerous of her more sizeable opponents, but she strikes tennis balls with true authority. Her relative lack of power she compensates for with precise ball placement and the natural agility, which allows to cover the court as well as any of her opponents. Martina’s body mechanics in tennis remain near flawless, displaying fluid body motion, allowing her to strike the ball by getting a full body into each return, even while running. In any pound for pound comparison, she puts as much power as humanly possible into each of her shots. In maintaining her career rankings, she dealt with tremendous pressure that she all took in stride to overcome a number of serious injuries and operations. Martina Hingis represents one of those rare breeds of true athletes that finds the idea of playing competitive tennis relaxing. In 1996, she drove herself to become the youngest ever women’s Grand Slam champion in history by parting with Helena Sukova and winning the women’s Wimbledon doubles crown. In 1997, she achieved a position as the undisputed world number one ranked player in women’s tennis that made the youngest ever player to reach the lofty position. The same year she defended and retained her Tennis Australian Open singles crown, a feat she followed up the next year again. In the intervening years from 1998 till the end of 2015 she racked up a series of unparalleled career victories that were marred by two forced retirements that she returned from, displaying a newfound gusto to rack up numerous more doubles titles, such as the five Majors titles and her third year end doubles championship. In 2000, she started dating Magnus Norman a Swedish tennis pro and later that same year Sergio Garcia the Spanish pro golfer. Later she had a brief engagement to Radek Štěpánek a Czech tennis pro that she split from during August 2007. After dating Julian Alonso and Ivo Heuberger, both former tennis pros she found happiness and married Thibault Hutin, a then aged 24 French equestrian show-jumping rider that she met in April the year before while competing. However, this lasted for just a short while with Hingis announcing to the Swiss press on 8 July 2013 that they had separated at the start of the year. Hingis is fluent in less than five languages and can entertain in German, Swiss German, English, Czech, as well as French.